The Antonov An-124 is a big four-engined cargo aircraft, suitable for carrying outsize and very heavy payloads up to 150 tons (330.000 lb). For some time it was the biggest aircraft in operational service in the world. The An-124 'Ruslan' (NATO-code 'Condor') is designed by the Ukrainian aircraft manufacturer Antonov, that is well-known as the maker of the biggest and heaviest aircraft in the world. In the 1960s it developed the An-22 turboprop, which was the biggest aircraft in the world at that time. It was followed by the An-124 Ruslan and later the An-225 Mriya, a stretched version of the An-124 and the biggest operational aircraft in the world at the moment. 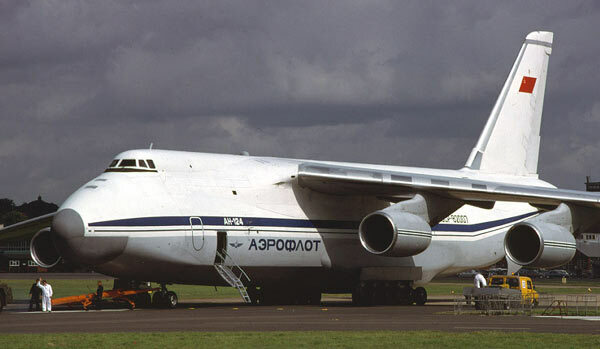 The Antonov An-124 was primarily developed as a strategic military transport aircraft in the same class as the American Lockheed C-5A Galaxy, but today it is mainly used as a civil cargo aircraft. The An-124 and the C-5A look much the same. The main visual difference is that the Antonov has a low tail and the Galaxy a so-called T-tail. The An-124 is a heavier aircraft with the ability to carry 25 percent more payload. In its military role it is intended to transport tanks, missiles and other heavy equipment. As a civil cargo aircraft the An-124 flies loads like hydraulic turbines, locomotives, big crane trucks, aircraft fuselages, helicopters and even sea yachts. The aircraft has set some dozens of world records. The first flight took place on December 26 1982 and commercial operations started with Aeroflot in January 1986. The aircraft is fitted with an enormous hinged upward moving nose-door and also large tail cargo doors. The aircraft can 'kneel' to allow easier access via the front loading door. The 24 wheel undercarriage allows operations from semi-prepared airstrips. 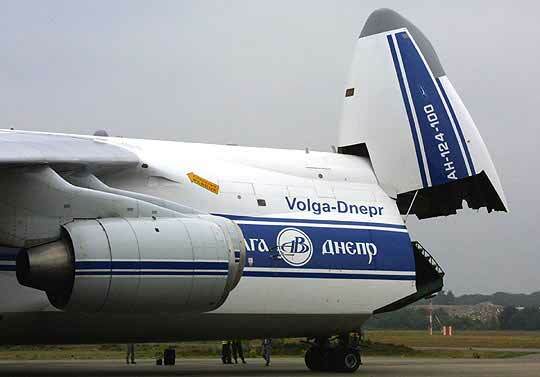 Other features of the Antonv An-124 are a fly-by-wire control system and a pressurised cargo compartment. The flightcrew comprises six persons: two pilots, two flight engineers, a navigator and a communications operator. The upper deck behind the wing offers accommodation for up to 88 passengers. The aircraft is fitted with onboard equipment for cargo handling, so that the aircraft can be loaded and unloaded independent of ground facilities. Military aircraft can drop cargo in flight and are suitable for dropping paratroopers. The military version is designated An-124 and the standard civil version as An-124-100. Because of its market potential many studies have been carried out to upgrade the aircraft with western engines, like the Rolls-Royce RB.211 and the General Electric CF6-80. Once a version was proposed with propfans, but this was never built. Antonov also considered a version as a waterbomber. The An-124-100M-150 is a modified aircraft carrying heavier payloads and enjoying a longer service life. Existing aircraft can be upgraded but the intention is also to restart production of this version. So far about sixty Antonov An-124 airplanes have been built. Production ended in the early 1990s, although five uncompleted airframes were finished between 2001 and 2004. There are also plans to build a stretched An-124-300 with features borrowed from the An-225, and a shortened version with a modified fuselage incorporating a higher cargo compartment.